PocketBook SURFpad 2 sleek and ergonomic body is available in three colors: black, red, and dark indigo. The front side of the device is equipped with a camera and a pair speakers. On the right side panel there is a 3.5mm audio out, microphone, mini HDMI connector, Micro USB (USB 3G modem support), microSD slot (Push-Push type, SDXC and SDHC support, up to 2TB). Multisensor 7-inch HD IPS display with a resolution of 1280 * 800 pixels ensures maximum video viewing experience. In-Plane-Switching (IPS) technology presents full color depth and ensures a bright and clear picture regardless of the viewing angle. Dimensions are 194 * 121 * 9.9, weight - 300 grams. It's not even the weight or size, although it is fair to mention that it is so light and thin you'd almost think you were browsing the web on a sheet of paper. That’s the matter of everyday use. Incredibly fast dual-core 1.5 GHz Processor and 1 GB of RAM provide instant feedback of any application, as well as simultaneous execution of multiple tasks and non-stop playback of any quality video files. 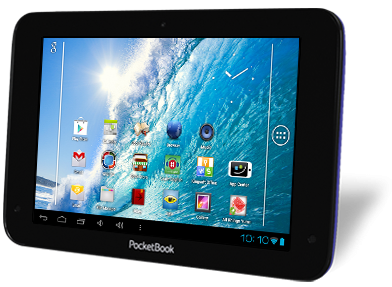 PocketBook SURFpad 2 tablet is powered by Android ™ 4.1. The device supports 10 video formats (ASF, MKV, AVI, MP4, FLV, WEBM, 3GP, MOV, MPG, WMV), 5 - Audio (MP3, WMA, AAC, OGG, MIDI) and 9 e-book formats (EPUB, PDF , FB2, TXT, HTM, HTML, DOC, DOCX, RTF). Lots of opportunities to work with pre-installed applications: Book Store, Kingsoft Office Multilang, MX Player, CoolReader, LearnEnglish (British Council application), IM +, AndroidPit, SPB TV, Evernote, Google and Yandex services, Vkontakte, Mail.ru agent, Odnoklassniki, Gismeteo, Vesti, Megogo, Ivi.ru and, surely, Play Market. 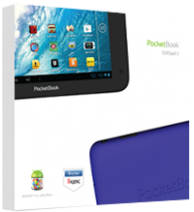 PocketBook SURFpad 2 is intended to be the favorite device of active, mobile and advanced users! A huge number of pre-installed applications, services, and entertainment content to will help withto deal perfectly with any issues.